As some of you may recall, this particular first day was a big one for him for a few reasons. First of all, he started at a new school! 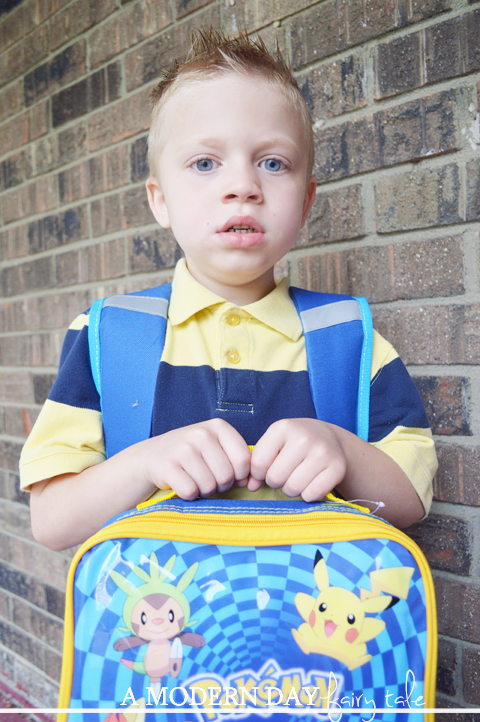 Being in a developmental kindergarten class last year meant he had to go where that class was offered, even though it wasn't his 'home' school. So, now that he is out of that class, it was time to change. Scary for a kid who doesn't handle transition well, but we started preparing him early and he could not be more thrilled with the change! But in even bigger news, this is his very first year in a mainstream classroom! Up until this point, he has been in a solely special education classroom (aside from a brief month immediately after our move when they placed him in an inclusion preschool class...which did NOT go well). When you have a child in special education, mainstreaming is a goal that you truly strive for, and the fact they they believe he is ready is an amazing sign of how much progress he has made over the last year. He will still be offered support throughout the day of course, but still in a classroom with typically developing children. Still, despite the excitement, it's also just a little bit scary. It means that he will be expected to act appropriately socially- something he still struggles with- and will have less support throughout the day than he has become used to. It means that he will need to be able to focus and stay seated and quiet more than before. And it means he will be in a classroom with peers who may not understand his differences. You see, Shaun so desperately wants to make friends, but like many on the spectrum isn't quite sure how to do so. He is VERY loving and loves to give hugs and be right next to those he loves- not understanding personal boundaries or that not everyone likes being hugged constantly. He doesn't understand that not everyone is into the same things he is, or wants to talk about that same thing over and over and over again. (Or answer the same question 10 times!) In his mind, this is how conversation and friendships work. Unfortunately, we've already seen that many kids (and adults alike) are annoyed by this. Kids especially don't know why he talks the way he does. I'm not worried about him academically. He's the smartest kid I know, and I know he will thrive. My hope for him this year is to find a friend or two who he can relate to and form a real relationship...and that he continues to do better socially and behaviorally. We are two days in and already he is thrilled to be there! 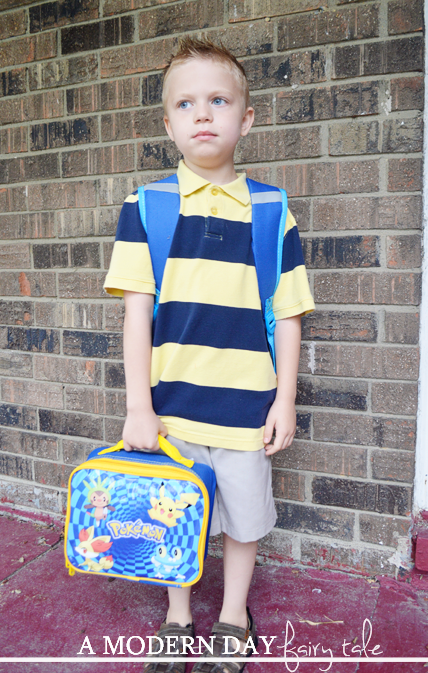 He is enjoying his teacher and the new school and seems to like his classmates as well. I cannot wait to see how much he learns and grows this year! He is going to be AMAZING!